KANSAS CITY, Mo. — Every year, it seems like the present to give during the holidays is a puppy or kitten. It's easy to get excited about adding another member to the family, but then reality sets in. 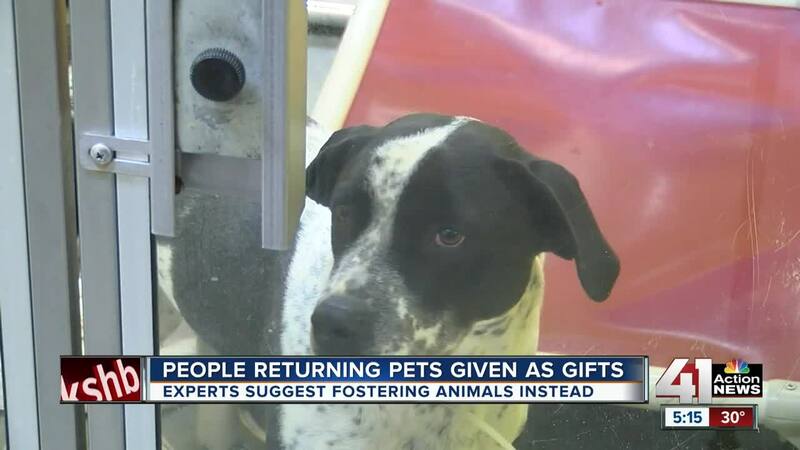 "After the holidays in the past, we have seen a lot of people return those animals when the fun and the excitement is all gone," said Casey Waugh, communications manager for Wayside Waifs in Kansas City, Missouri. Shelters around Kansas City said that those on the fence about adopting an animal can try fostering first. Wayside Waifs currently has around 250 foster families, and together they fostered more than 1,200 animals in 2018, Waugh said. Kayla Rogers-Sigetich, who recently fostered a cat that was adopted, said fostering an animal is a good first step to see if you're ready to adopt. "It gives somebody an idea of what it's going to be like to have an animal in their house without fully taking on that commitment. If it's not something they are ready for," Rogers-Sigetich said. She said fostering and ultimately adopting an animal is worth all of the work. "For me, giving back to a shelter that gave me my three favorite things in the world is really important. So, fostering is a great way for me to do that," she said.